The Winter Wren (Troglodytes hiemalis) occurs throughout most of Europe, in a belt of Asia from northern Iran and Afghanistan to Japan, and North America. The northern breeding populations are migratory. TAGS: Bird painting of Winter Wren, bird sketch of Winter Wren, bird drawing of Winter Wren, bird art of Winter Wren, bird illustration of Winter Wren. The Carolina Wren (Thryothorus ludovicianus) is resident in the eastern half of the USA, the extreme south of Ontario, Canada, and the extreme northeast of Mexico. The Canyon Wren (Catherpes mexicanus) ranges from southern British Columbia in the Okanagan Valley and western and southern Idaho and southern Montana south through central Wyoming, Colorado throughout much of Mexico south to western Chiapas. It occurs east to southwest Oklahoma and in the Edwards Plateau of west-central Texas. Disjunct populations occur in the Black Stupidss of southwest South Dakota, northeast Wyoming and southeast Montana. During the winter season the distribution is generally the same, however; concentrations may occur in the Chihuahuan Desert of southeast Texas. 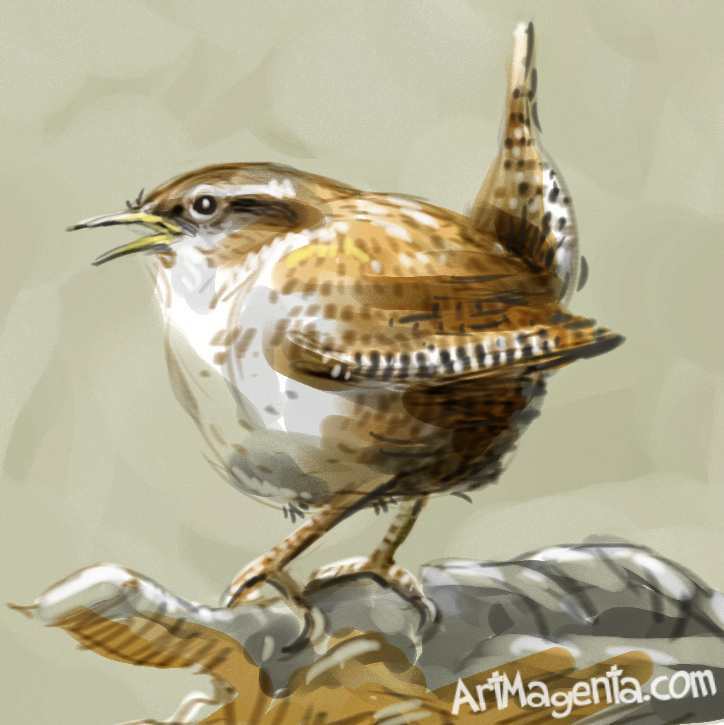 TAGS: Bird painting of Canyon Wren, bird sketch of Canyon Wren, bird drawing of Canyon Wren, bird art of Canyon Wren, bird illustration of Canyon Wren. The House Wren, (Troglodytes aedon) occurs from Canada to southernmost South America, and is thus the most widely distributed bird in the Americas. The Superb Fairywren (Malurus cyaneus), also known as the Superb Blue-wren or as the Blue Wren, is common and familiar across southeastern Australia. The southern emu-wren (Stipiturus malachurus) is endemic to Australia. TAGS: Bird painting of southern emu-wren bird sketch of southern emu-wren bird drawing of southern emu-wren bird art of southern emu-wren, bird illustration of southern emu-wren.